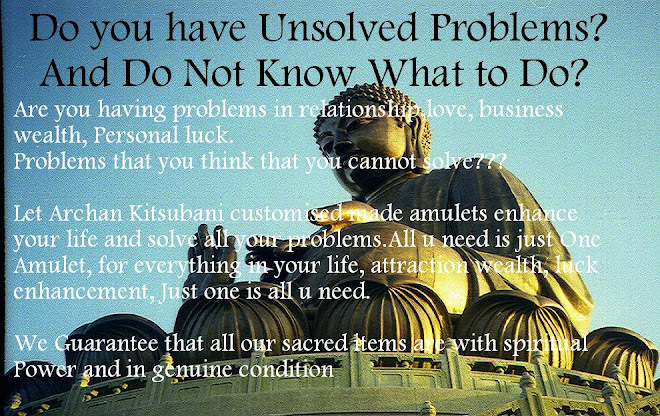 I created this blog is to share with you the experiences and the magical effect of Archan Kitsubani holy items. Archan Kitsubani, is famous in making ATTRACTIONS, WEALTH, SOUL amulets (especially: Kumantong). When he was at his age of 10. He started learning Thai spell and witchcraft from a Thai monk in Cambodia. And when the first monk passed away. There are two other Archan who are from Laos and Cambodia continue teaching him in regardless of the Thai religious. RIGHT NOW, he is one of the famous Archan in SIngapore, Thailand, Cambodia, Hongkong, Taiwan and China. All of his holy items are hand made, and special ingredients like: bones ashes, corpse oil, corpse flesh are added, in order to bring the spiritual effect to the TOP!!! Most importantly , master made very LESS quantity EACH TIME. And this is why Archan Kitsubani's amulets are so RARE, LIMITED and STRONG. I collected most of his amulets because of the limited pieces produced and the effectiveness of his amulets. When I reaches Singapore, as soon as I close my eyes and start chanting.Guess what?? ?I could feel a COLD chill down my spine!!! Till now I will never forget that strange feeling. I still remember that when I close my eyes , I managed to see an image of a blue light rising from an altar. And that night I confessed it to master and he told me that it is the Spiritual Power of the amulet. I am quite amazed because it is simply too FAST and Unbelievable!! !